Let me ask you a question: how often do you allow yourself to be vulnerable? Whether it’s a new career, business idea, relationship or a new hobby, it takes courage to put yourself out there, try something new and put your heart and soul on the line. Many might deem it ‘too risky’ and so they don’t chase their dreams but let them go. Humans are wired for certainty, which means that too often people prefer to cling on to the certainty of a situation even if it is negative, rather than venture into the unknown. Yet the power of embracing your vulnerability is going into the unknown willingly without any guarantees, allowing yourself to be seen for who you really are and is where you discover your true strengths. In Bréne Brown’s insightful Ted Talk on The Power of Vulnerability, she explores the struggle so many of us have with vulnerability but also how essential it is if we want to live a truly whole-hearted life. For many of us, the fear of failing, being mocked, hurt or rejected – or that we may not be good enough – is so painful that we avoid situations in an attempt to protect ourselves rather than be vulnerable and then we miss out on potential opportunities for growth and happiness. I love this quote so much that I have it on my pin board at home as a daily reminder that in order to grow we need to have the courage to be vulnerable, take a chance on ourselves, have faith and go for what we want. There have been many times in my life when I have felt vulnerable. There have been times when I’ve let it hold me back and I missed out on opportunities to grow personally or professionally. There have also been times when I’ve found myself at a crossroads, and embraced my vulnerability and taken leaps… and that led to many more leaps. Looking back these have triggered the most profound and rewarding transitions in my life. Where am I resisting being vulnerable? What am I frightened might happen if I allow myself to be vulnerable? And how could I deal with that? What is the price I pay for not going for what I want? If you were willing to let go of who you think you should be in order to be who you really are, how would you and your life be different? It may be scary to take a chance when you’re feeling vulnerable but it can also be the most exhilarating and rewarding thing you do for yourself. To resist being vulnerable is to repress the most authentic parts of you. 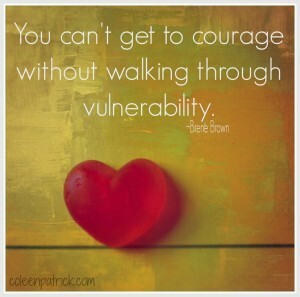 To be vulnerable is not easy but it is to accept yourself completely. Letting go of who you think you should be in favour of who you really are not only gives room to express your most authentic self but opens you up to greater love (self-love and connection with others) and a more fulfilling life. If you would like to a one on one session(s) to help you gain clarity on where you want to be, discover your true strengths and values, understand what is keeping you stuck and how you can move past that to reach your goals then why not get in touch. I’d love to hear from you!